Dieses gemütliche Ferienhaus liegt nur wenige Schritte entfernt, den Sonnenaufgang auf Muskegon See und den Sonnenuntergang am Lake Michigan aus beobachten und es ist auch in der Nähe Radweg, Restaurants und vielen Attraktionen. Neu renoviert, bietet dieses charmante aktualisiert Bungalow der perfekte Ort, um sich zu entspannen und einen Sommerurlaub genießen. Es gibt zwei Schlafzimmer mit Doppelbetten und ein Queen-Size-Schlafsofa im Wohnzimmer, Waschmaschine, Trockner, Essbereich im Freien, Grill, TV, WLAN, zentrale Klimaanlage und alles, was Sie brauchen, um Ihr Zuhause zu genießen. Demnächst werden neue, fabelhafte Fotos des 2019 hinzugefügt - ein weiteres Schlafzimmer, ein Badezimmer, eine Waschküche -, die sich derzeit im Bau befindet. The bungalow is charming and very clean. Will definitely book again. 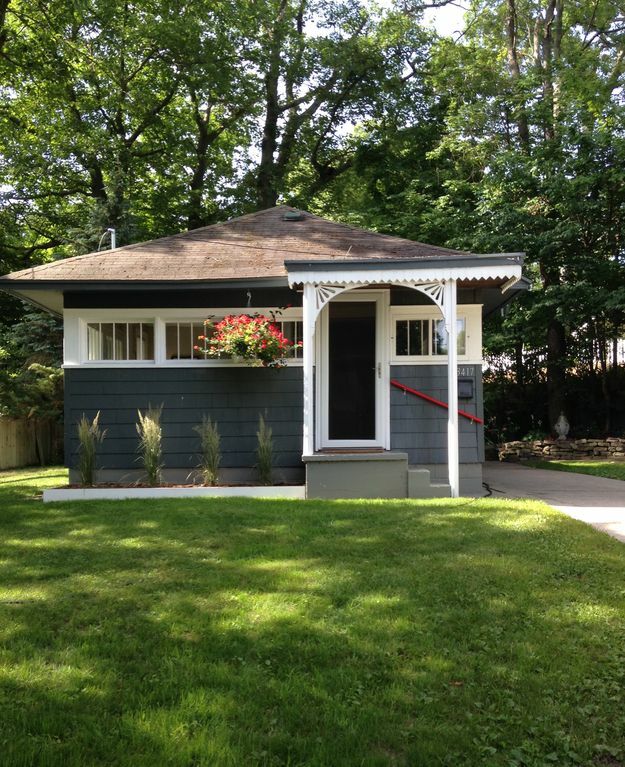 Very nice location, within walking distance of both Lake Michigan and Muskegon Lake. The cottage was so cute and very comfortable with everything we needed plus things we didn't even know we needed! Weather was fantastic and beaches nice and not too crowded. Would stay again, loved it!! so happy to hear everything was great for your week at the beach. Enjoying time together with your girls is priceless... glad we could be a part of your vacation. Come and stay with us again! Beautiful piece of property with all necessary amenities for a great vacation. This house is quaint and just perfect for a small family of four. The various seating areas outside offered a nice getaway. While the house is pretty close to the lake, we thought it was actually closer. A previous review had read that it was a “one-minute walk to the beach”...I would say it’s closer to ten minutes, and definitely not a walk to take with small kids. Great communication with and attentiveness from the owners. You can tell they are passionate about the home. Thanks for your positive review! So glad you enjoyed your stay at the Beach Bungalow, we hope you come again. We came up for the long weekend and had the best time. The cottage was wonderful, everything we needed and more! Kathy had left us information on upcoming activities in the area, along with a book of sites and interest in Muskegon and Michigan. Even though we were not right on the beach, it was close enough to walk to several times a day and without all the sand tracking in. We will definitely come back and stay! Thanks for the kind words about your stay at the Beach Bungalow😎 so happy you had a great time. We hope you come again to enjoy our beach. Clean, well stocked, everything they said. We wanted a cozy getaway for our second honeymoon. That's exactly what were got. It was very clean, everything we needed to do or own cooking (except the food🙂), plenty of towels, etc. Location was convenient to Lake Michigan, places in Muskegon and Grand Haven. Enjoyed our stay. This beach bungalow is tastefully decorated and immaculately clean. As promised, it is a one minute walk to the beach. We had appetizers and wine at one outdoor table, then dined al fresco at another. The kitchen is nicely equipped with everything one needs to prepare a delicious meal. The owners are very accommodating and were available via text messaging instantly. I would highly recommend this charming cottage. So happy you enjoyed your stay at the Beach Bungalow and glad we could help make the birthday celebration special! We loved having you... please visit us again. cancellation policy - full refund 30 days prior to reservation date after that 50% refund - renter must be 25 years or older. Summer rentals are Check in Saturday by 2pm check - out next Saturday by 10am. full week rental only during season.